We are pleased to inform you that, based on the information and materials supplied, the Certificate of Memorandum Alteration issued on February 12, 2008 by the Nova Scotia Registrar of Joint Stock Companies, and assuming that the activities will be as stated in the application, as amended and clarified during the application process, we have determined that the Cromarty Community Indoor Tennis Centre qualifies for tax-exempt status as a registered charity under paragraph 149(1)(f) of the Income Tax Act (the Act). (c) that the Cromarty Community Indoor Tennis Centre and the Cromarty Tennis Club are completely separate entities, with separate books and records. (d) providing relief to persons with disabilities by developing and implementing tennis programs for the disabled. • the charity will have to file its first annual return on or before June 30, 2009, for the fiscal period ending December 31, 2008. 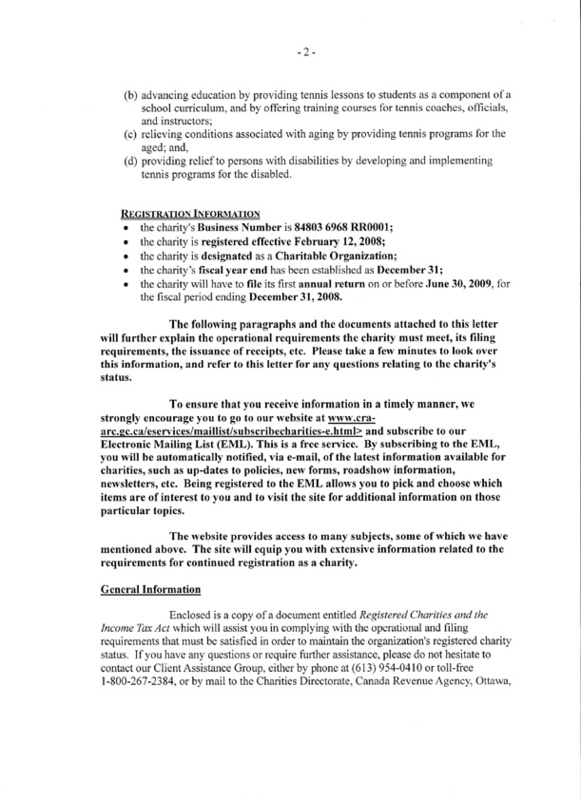 The following paragraphs and the documents attached to this letter will further explain the operational requirements the charity must meet, its filing requirements, the issuance of receipts, etc. Please take a few minutes to look over this information, and refer to this letter for any questions relating to the charity's status. To ensure that you receive information in a timely manner, we strongly encourage you to go to our website at www.cra-arc.gc.ca/eservices/maillist/subscribecharities-e.html and subscribe to our Electronic Mailing List (EML). This is a free service. By subscribing to the EML, you will be automatically notified, via e-mail, of the latest information available for charities, such as up-dates to policies, new forms, roadshow information, newsletters, etc. Being registered to the EML allows you to pick and choose which items are of interest to you and to visit the site for additional information on those particular topics. The website provides access to many subjects, some of which we have mentioned above. The site will equip you with extensive information related to the requirements for continued registration as a charity. 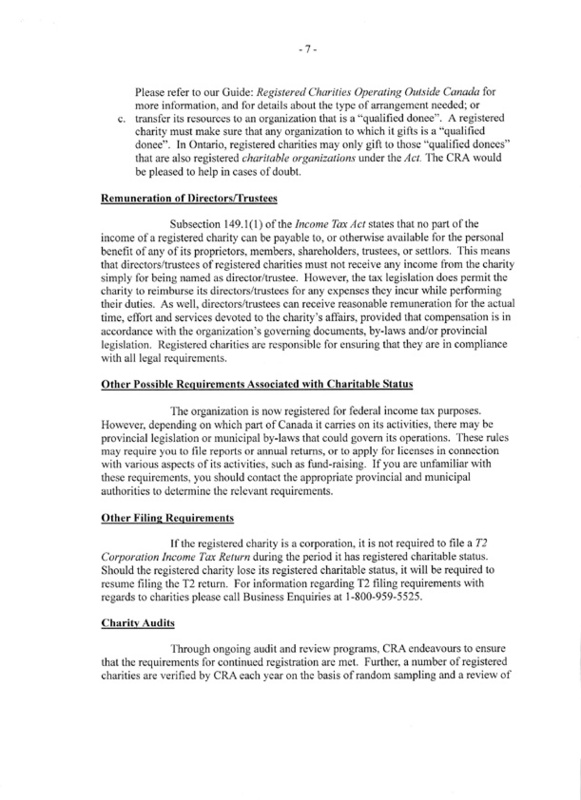 Enclosed is a copy of a document entitled Registered Charities and the Income Tax Act which will assist you in complying with the operational and filing requirements that must be satisfied in order to maintain the organization's registered charity status. If you have any questions or require further assistance, please do not hesitate to contact our Client Assistance Group, either by phone at (613) 954-0410 or toll-free 1-800-267-2384, or by mail to the Charities Directorate, Canada Revenue Agency, Ottawa, ON KIA OL5. Any questions pertaining to the GST may be addressed by telephoning toll-free at 1-800-959-5525. 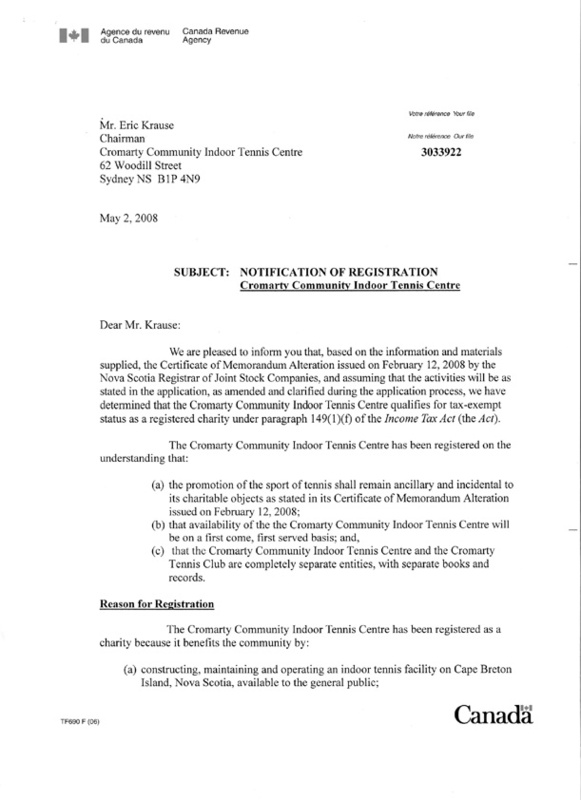 Your organization has been registered under the name that appears on your governing document: Cromarty Community Indoor Tennis Centre. This name must be reproduced in full on all official donation receipts issued by your organization. The Business Number (BN) system was implemented in April 1997. The BN consists of a nine-digit root, followed by a two-letter, four-digit account identifier. The nine-digit root is the same for each account the organization may have with Canada Revenue Agency (CRA). However, the two-letter, four-digit account identifier will be different for each account. The organization's charitable status is acknowledged by the RROO01 - account identifier. Please note that the charity's BN should be written in full, including its charity account identifier, on all receipts it issues. We have determined that the organization is a Charitable Organization because it meets the requirements of that definition as set out under subsection 149.1(1) of the Act. This designation determines the operational requirements that the charity will have to meet under the Act. These requirements are described in the information document referred to above. If you think this designation does not accurately reflect the present structure, source of funding or mode of operation of your organization, please write to us within sixty days of the mailing of this letter, clearly setting out your reasons. At a later date, if the charity undergoes any of the modifications described in the next section, it may be required to change its designation. You may also wish, for other reasons, to see the organization's designation changed. In both cases, you would have to apply for re-designation by completing form T2095. We have registered the organization based on the information provided with the application. If the organization wishes to formally change its stated purposes or objects, it should obtain our prior approval, because this may affect its status. If the organization wishes to undertake programs and activities that are materially different from those in the information already submitted to us, it should make sure that they are within the scope of the organization's stated purposes. Moreover, if the programs or activities are different from those we reviewed, they may not be charitable. As a precaution, we recommend that you check with us beforehand. If the organization actually undertakes programs that are not charitable, its registration may be revoked. Furthermore, if the charity's sources of support, character, or method of operation were to change, you are required to advise us immediately, so that we may consider any impact this may have on its registered status. In addition, you are required to advise us if the relationships (by blood, marriage or adoption) among the directors and officials change. These types of changes might affect the charity's designation and the operational requirements it has to meet under the Act. Registration has been granted on the understanding that the organization will not undertake any activity(ies) beyond those described in the application for charitable registration, unless it has received prior approval to do so from our office. Accordingly, if at some future time the organization wishes to pursue a new activity/program that was not described in its application for charitable registration, it must provide our office with a detailed description of the proposed activity/program so that we may determine whether or not it is acceptable. This is necessary to ensure that the organization will operate within the limitations imposed by the Act. In order to satisfy the essential requirement of public benefit, the activities (programs and services) of a registered charity cannot be provided for the benefit of named, or unacceptably limited, persons. Doing this would provide a private benefit which is not charitable. In order for donors to benefit from the tax incentives associated with gifting to a charity, they must receive an official receipt issued by a registered charity. Official receipts are those issued by a registered charity that meet the requirements set out under Regulation 3501 of the Income Tax Act Regulations. 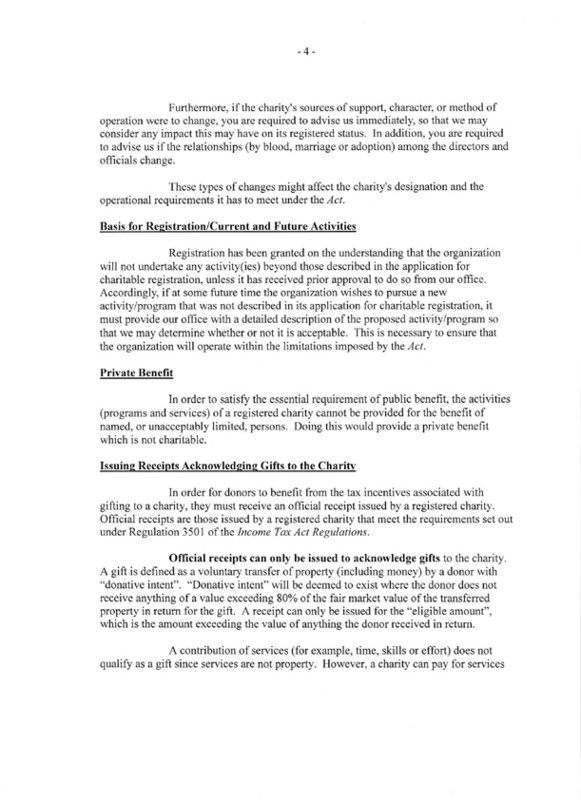 Official receipts can only be issued to acknowledge gifts to the charity. A gift is defined as a voluntary transfer of property (including money) by a donor with "donative intent". "Donative intent" will be deemed to exist where the donor does not receive anything of a value exceeding 80% of the fair market value of the transferred property in return for the gift. A receipt can only be issued for the "eligible amount", which is the amount exceeding the value of anything the donor received in return. A contribution of services (for example, time, skills or effort) does not qualify as a gift since services are not property. However, a charity can pay for services rendered and later accept the return of all or a portion of the payment as a gift, provided it is returned voluntarily. For more information on what constitutes a gift in charity law and issuing receipts, please refer to our website at www.cra-arc.gc.ca/charities or call our toll free line at 1-800-267-2384. A registered charity must keep adequate books and records so that we can establish that it continues to comply with the requirements for registration as a charity. For further details please see the enclosed Information Circular No. 78-1 OR4 entitled "Books and Records Retention/Destruction" and visit our website at http://www.cra-arc.gc.ca/tax/business/topics/ecomm/books-e.html for information on electronic books and records. • A copy of the registered charity's financial statements. • a breakdown of remuneration to directors, executive officers, to employees engaged in charitable activities and to employees engaged in other activities. Although the information return forms are forwarded annually to all registered charities for their use and to remind them that the return must be filed, it is the charity's responsibility to ensure that it meets its annual filing requirements, without prior notice by CRA. It is important, therefore, for the Charities Directorate to always have the current address of the charity. Failure to file the return within the prescribed six-month period following each fiscal year end could result in the revocation of the organization's registered status (see below). A registered charity may gift only to qualified donees described in subsection 149.1(1) of the Act (see appendix attached). In Ontario, registered charities may only gift to those "qualified donees" that are also registered charitable organizations under the Act. In all cases, once the Minister of National Revenue has issued a notice of intention to revoke the organization's registration as a charity under the Act, the charity may subsequently divest itself of its assets only to eligible donees described in subsection 188(1.3) of the Act (see appendix attached). Further information about gifting and disposing of assets can be obtained from our Client Assistance Section (613-954-0410 or toll-free 1-800-267-2384). 1. For charitable activities undertaken by the registered charity itself -its own charitable activities. These are activities/programs that are conducted under the charity's direction and control. Such activities may be conducted by the charity's employees or volunteers, or by its "intermediaries" (agents, contractors or partners). At all times, the charity must be able to demonstrate direction and control over, and fully account for, all resources used. 2. For gifting to "qualified donees" as defined in the Act. 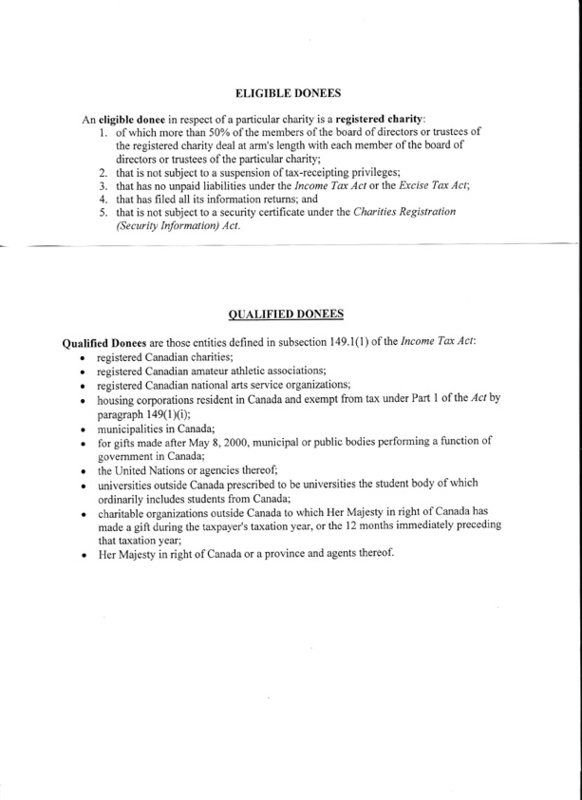 For the most part, "qualified donees" are other registered Canadian charities. Individuals, and most organizations outside Canada such as foreign charities and international aid agencies, are not "qualified donees". The attached appendix contains a complete list. For registered charities that are designated as charitable organizations, gifts to "qualified donees" must not exceed 50% of the charity's income for that year. Public foundations will gift over 50% of their income to qualified donees on an annual basis. 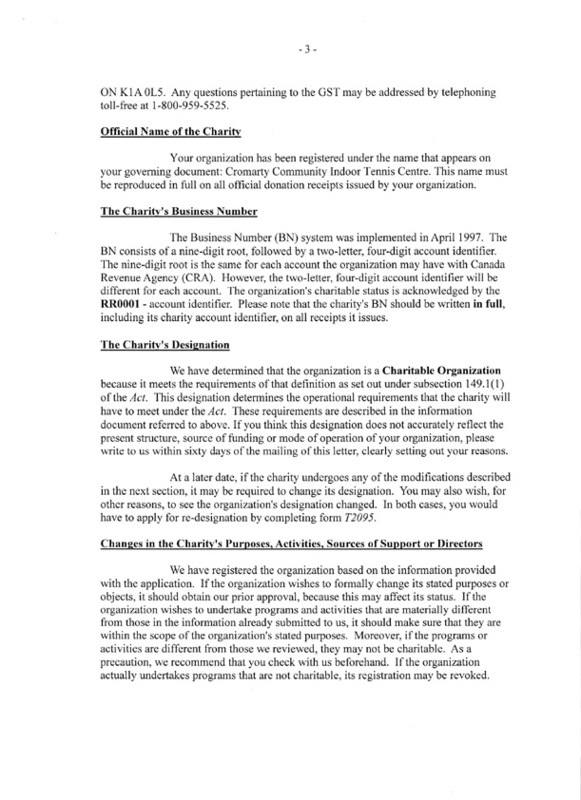 Please refer to page 3 of this letter for your charity's designation, and to page 4-5 of the enclosed Guide entitled Registered Charities and the Income Tax Act for additional information. b. transfer its resources to an individual or organization that is its intermediary according to a structured arrangement. The arrangement must clearly show that the registered charity maintains direction and control over the use of its resources. c. transfer its resources to an organization that is a "qualified donee". A registered charity must make sure that any organization to which it gifts is a "qualified donee". In Ontario, registered charities may only gift to those "qualified donees" that are also registered charitable organizations under the Act. The CRA would be pleased to help in cases of doubt. Subsection 149.1(1) of the Income Tax Act states that no part of the income of a registered charity can be payable to, or otherwise available for the personal benefit of any of its proprietors, members, shareholders, trustees, or settlors. This means that directors/trustees of registered charities must not receive any income from the charity simply for being named as director/trustee. However, the tax legislation does permit the charity to reimburse its directors/trustees for any expenses they incur while performing their duties. As well, directors/trustees can receive reasonable remuneration for the actual time, effort and services devoted to the charity's affairs, provided that compensation is in accordance with the organization's governing documents, by-laws and/or provincial legislation. Registered charities are responsible for ensuring that they are in compliance with all legal requirements. The organization is now registered for federal income tax purposes. However, depending on which part of Canada it carries on its activities, there may be provincial legislation or municipal by-laws that could govern its operations. These rules may require you to file reports or annual returns, or to apply for licenses in connection with various aspects of its activities, such as fund-raising. If you are unfamiliar with these requirements, you should contact the appropriate provincial and municipal authorities to determine the relevant requirements. If the registered charity is a corporation, it is not required to file a T2 Corporation Income Tax Return during the period it has registered charitable status. Should the registered charity lose its registered charitable status, it will be required to resume filing the T2 return. 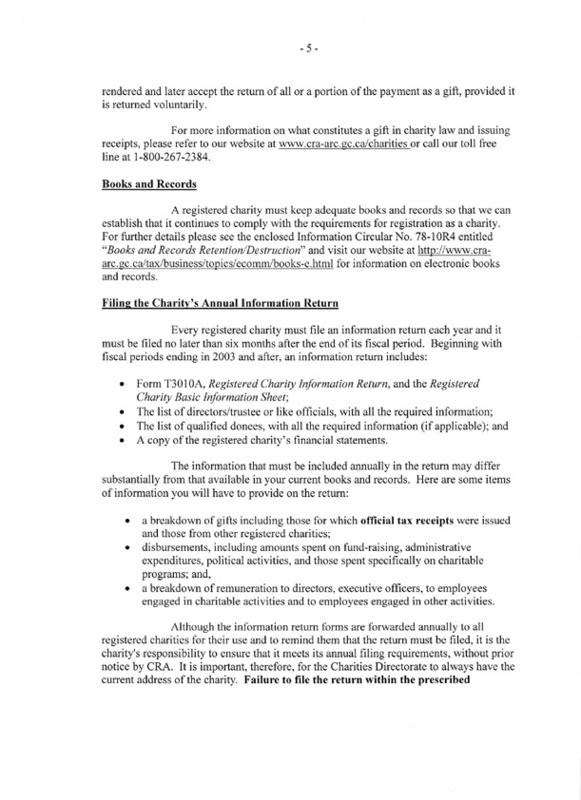 For information regarding T2 filing requirements with regards to charities please call Business Enquiries at 1-800-959-5525. Through ongoing audit and review programs, CRA endeavours to ensure that the requirements for continued registration are met. Further, a number of registered charities are verified by CRA each year on the basis of random sampling and a review of the annual returns filed by charities. Where the charity is not complying with the Act, its registration may be revoked. In the event that the charity loses its charitable status, either on a voluntary basis or for cause, it would lose its tax-exempt status as well as its authority to issue official receipts for income tax purposes. Further, it would be subject to a tax equal to the value of any remaining assets not disposed of in a prescribed manner. 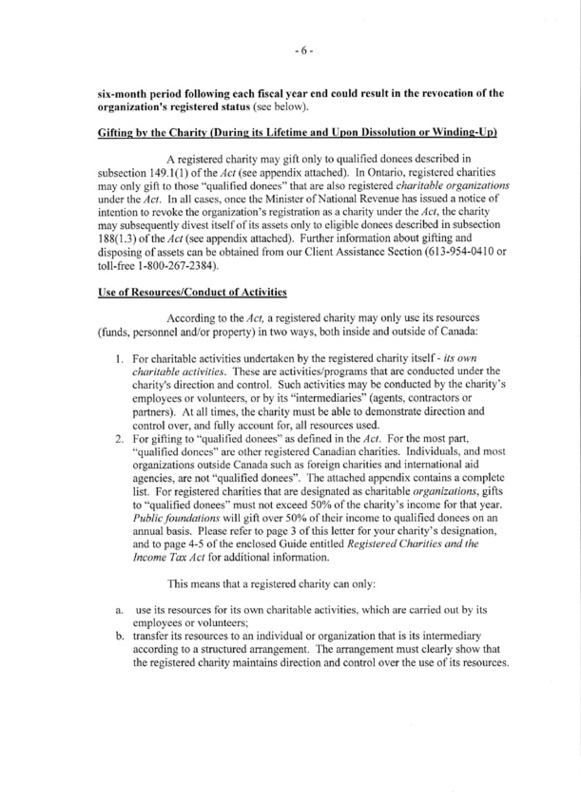 Please refer to the section entitled Revocation of a charity's registration at page 13 of the document entitled Registered Charities and the Income Tax Act. Form T3010, Registered Charity Information Return, and its related schedules are mailed out each year after the end of the registered charity's fiscal year. To help with completing the return, Guide T4033, Completing the Registered Charity Information Return, is available online through the CRA's Charities and Giving Web site (www.cra-arc.gc.ca/charities). The CRA recognizes that a number of registered charities do not have access to high-speed Internet. Therefore, most of our guides are available in both PDF and HTML formats. Documents in HTML format are Web-based, load faster than those in PDF, and are more convenient to navigate online. Registered charities can access Guide T4033 in HTML format, click on the sections of relevance to them, and print individual sections relatively quickly. PDF is the better format to print the entire guide, but it is more difficult to navigate online, and takes significantly more time to load on your computer. Newly registered charities are encouraged to sign-up for the Charities -What's New electronic mailing list on our Web site. The Charities Directorate uses this list to inform registered charities about policy updates, new forms, the registration process for the Registered Charities Information Sessions (formerly Roadshows), and the newest edition of our newsletter. We encourage registered charities to make use of our Web site. It provides access to most of our forms and publications, as well as guidelines outlining the requirements for your organization's continued registration as a charity. 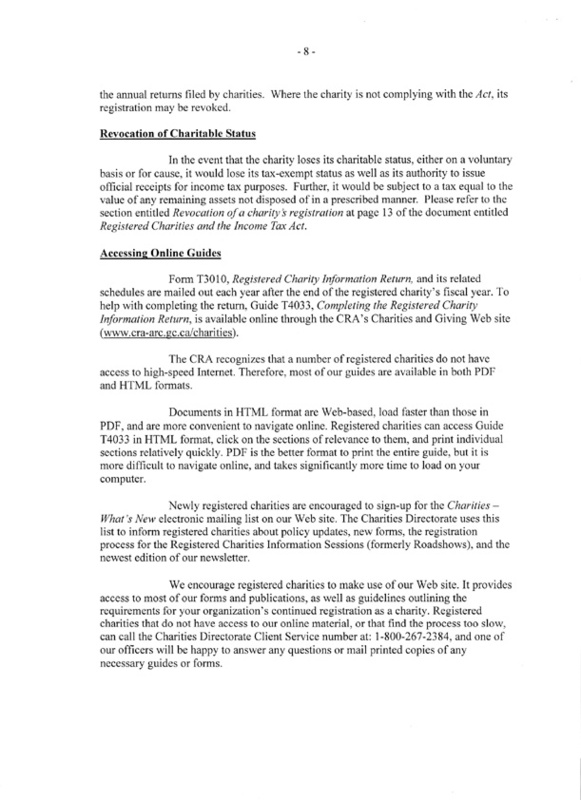 Registered charities that do not have access to our online material, or that find the process too slow, can call the Charities Directorate Client Service number at: 1-800-267-2384, and one of our officers will be happy to answer any questions or mail printed copies of any necessary guides or forms. 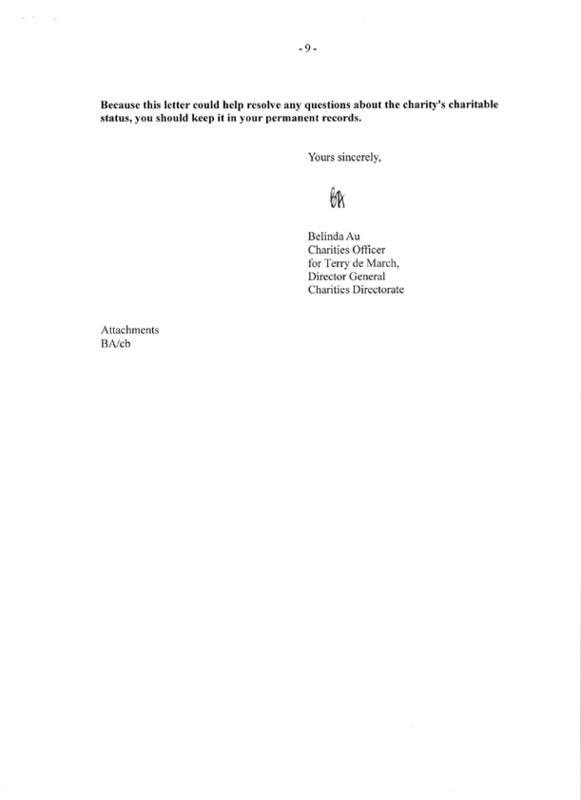 Because this letter could help resolve any questions about the charity's charitable status, you should keep it in your permanent records. 5. that is not subject to a security certificate under the Charities Registration (Security Information) Act. • Her Majesty in right of Canada or a province and agents thereof.